Our innovative and custom engineered industrial telecom solutions will meet the challenging demands from our customers and will ensure the greater customer satisfaction. All our solutions are fully engineered and supported by our professional teams during installation and maintenance. We enjoy strong relation with many industry leading manufacturers, and together we provide comprehensive range of solutions to our customers. Our TNMS provides user monitoring of all network devices with various advanced feature such as graphical display which indicates exact fault location of the device, alarms, history of alarms etc from a centralize monitoring system. 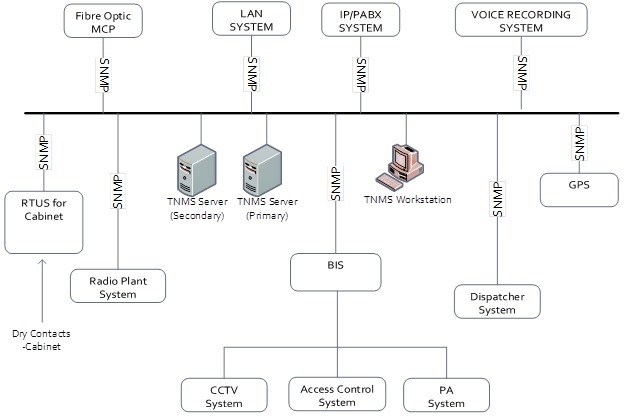 Our TNMS can be integrated with multiple system such as network switches, firewalls, routers, CCTV, radio systems on SNMP protocol however communication protocol in not limited to SNMP only, a third party communication protocol can also be develop for such devices.